In October, overall vehicle sales increased by 13.4% compared to October 2009, but that increase was largely because light truck sales increased by 23.5%, more than six times the 3.9% increase in passenger car sales. Year-to-date, truck sales are up by 16.7%, more than three times the 5.3% increase in passenger car sales so far this year. AutoNation Chairman and CEO Mike Jackson (featured on a CD post in June): "I've always said, when you want to know when this economy is going to turn, just watch the pickup sales. All those sales are small businesses and entrepreneurs, and when they see the prospect for better business, they're going to go out and finally buy a new pickup truck. So this is a key indicator of what's going on in the U.S. economy. This is small business America saying that the worst is over, I see opportunities in the future, I feel confident enough to go out and buy a new truck. Pickup trucks are bought by small business entrepreneurs who have their finger on the pulse of the U.S. economy. It's an expression of confidence in future of economy. They don't buy until they see the prospects for business are brighter." "Trucks outsold cars by the highest margin in nearly five years in October, a sign the economy may be starting to improve. These trucks aren't the tractor-trailers that haul freight. 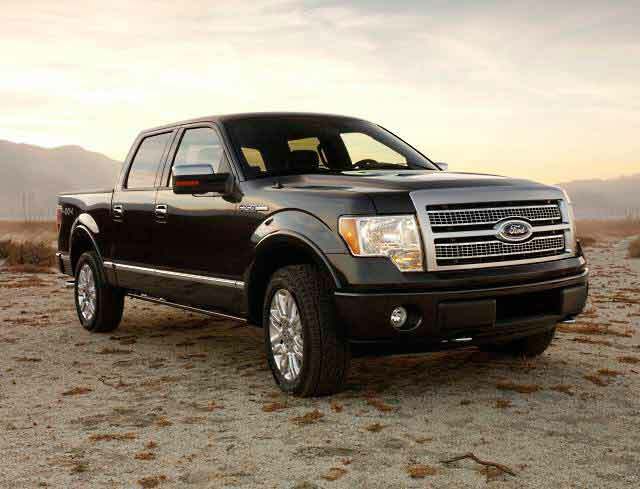 They're pickups, SUVs, minivans and smaller SUVs. The category — known as light-duty trucks — made up 54 percent of all new U.S. vehicle sales last month, compared with 46 percent for cars, according to industry tracker J.D. Power and Associates. It's the biggest difference since December 2005, when trucks accounted for 56 percent of sales. Strong truck sales make economists giddy because they mean people are willing to spend money again. Small business owners feel comfortable enough to buy a new pickup truck or delivery van for their company; and regular folks are confident enough in their jobs and finances to take on beefy SUV payments." It looks like a bubble to me. What's with all the Y-O-Y percentages? What are the sales numbers? The AP tries to use $3-4/gal fuel cost as a cause for the slowdown in the last two years, but the fact is that gas was $1.46/gallon when Obama was elected in November 2008. Now it's back to almost $3/gal (but remember sheep, inflation is only 4%). I'm not buying their fuel cost argument. Maybe people aren't "hoarding their cash at the bank" because it lost another 10% of value in September. Scrap metal prices are up. Maybe they'd rather have a physical truck they can depreciate to keep pace with inflation than devalued green paper. OK, I think I had one economics course in my life, so I'm just asking the question. If the economy is looking brighter -- pick-up sales up, shipping up, etc. -- then why did the Fed feel the need to print $600 billion to buy its own paper? That's not an accusatory question. I honestly hope someone can answer it for me before I mortgage my house to buy gold bullion in a panic. Unfortunately Dr. Perry misses the point by only looking at one half of the equation. Would that make the Manheim Used Car indexes the one for mere mortals? Explain why the GOP has been willing to contribute to that jobless recovery, via their indifference to illegal immigration(to cover the low end) and offshoring (to cover the middle class and non-consultant high end)? That seems like they're willing to be out of touch with small, US-based businesses that create US jobs. While that may not represent the entirety of the GOP, the "jobs anywhere but here" people are a major contributor to the jobless recovery. I thought we were legislating those nasty trucks out of existence, just like the tens of millions of jobs in fossil fuel, fisheries, dirty manufacturing and part time wages. Where I live in upstate NY, probably 2 out of 3 families own a pickup truck. They are the last vehicles available which are roomy, heavy and powerful. Increased sales are certainly a good sign, but not necessarily one for business. Well...I hope this is true. This recession has been so preverse that almost all past indicators of recovery have been useless. Two years ago, every farm in the county had a bobcat or two at the end of the driveway for sale. You could buy a $30,000 bobcat for $12,000 with 800 hours on it. Juandos is probably right about EPA, and I'm a chemist by training. Still, I'm not sure how we benefit from employment that kills us. Well hydra I'm also a chemist by training and I wonder why people invest trust in the EPA? What makes the EPA any more credible than the scientists that are either in industry or academia?